I always try and go out of my way to make something extra special for Brandon's birthday. He loved the Mini Peanut Butter Cheesecakes, and the DIY Ice Cream Sandwich Bar. but I knew I wanted to go for something a touch more grandiose for this birthday. 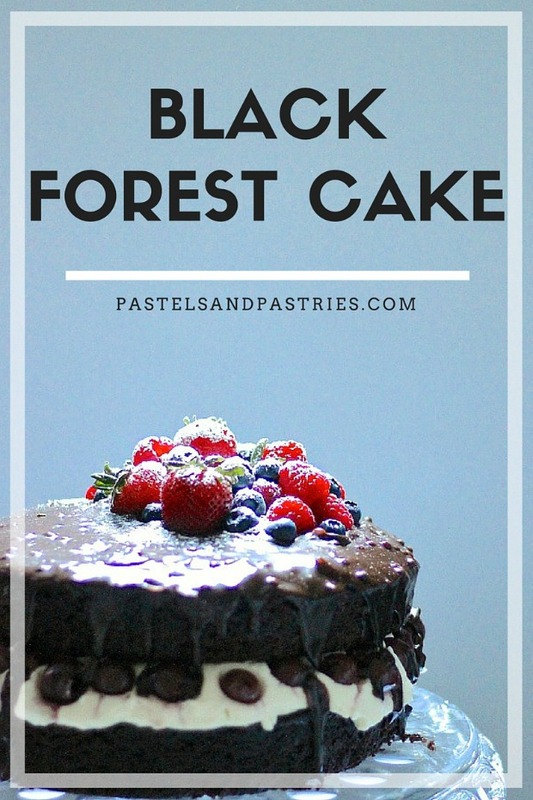 He had mentioned his love for Black Forest Cake (which completely shocked me because I can't stand it) in passing a few times over the year and I made a mental note to save the idea for his birthday cake. Personally, it's not my thing! Give me a soft baked, chewy, chocolate chip cookie with some ice cream scooped on top and all the toppings and I am a happy girl. I had a hard time choosing a recipe because honestly the combination of cherries, fruit syrup and chocolate did not entice me.. at all. But it's not all about me! When I saw this recipe on Butter and Brioche had the inclusion of mascarpone cream frosting in the middle I knew it was a winner. I mean-- he does take cheese lover to new heights. It was a process to assemble this cake. I made the cakes the day prior to celebrating so they would be cooled and ready to be iced. I went with 2 cakes, because I only had two pans and decided I did not want to make 4 layers. You start with the cake, then the frosting, and then the cherries and cherry syrup. 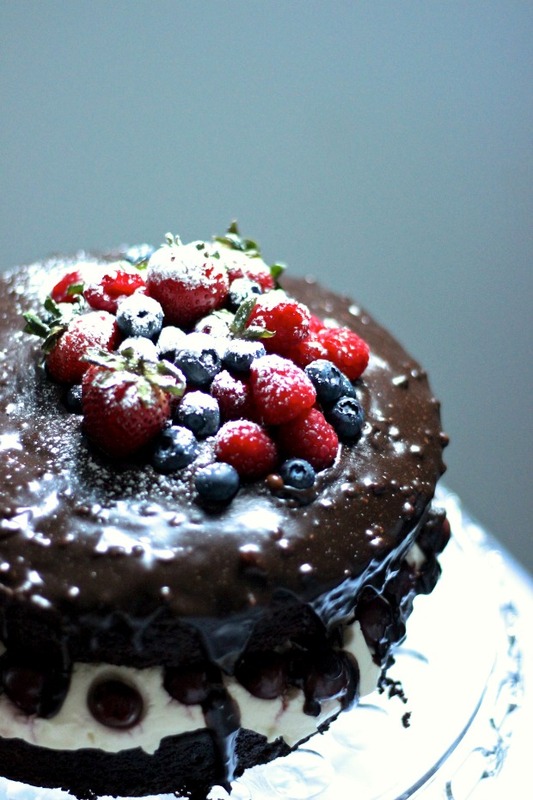 The dark chocolate ganache (my favourite part) tops the cake and then the fresh fruit is added to the top. 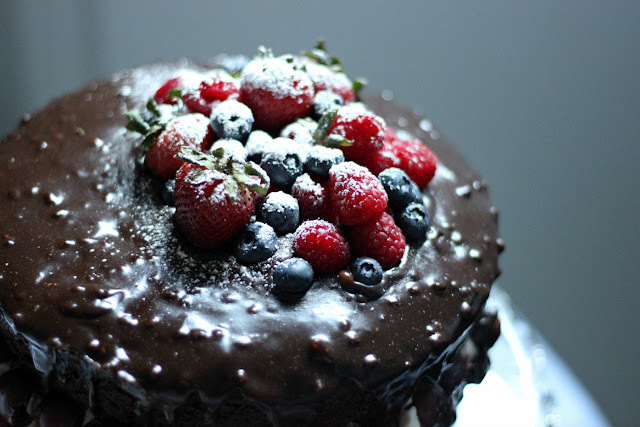 It's definitely a dense, moist, decadent cake and perfect for special occasions. I love the look of the fresh fruit and a light dusting of icing sugar on the top. And most importantly, he loved it, especially the cheese frosting, so that's a win in my books! 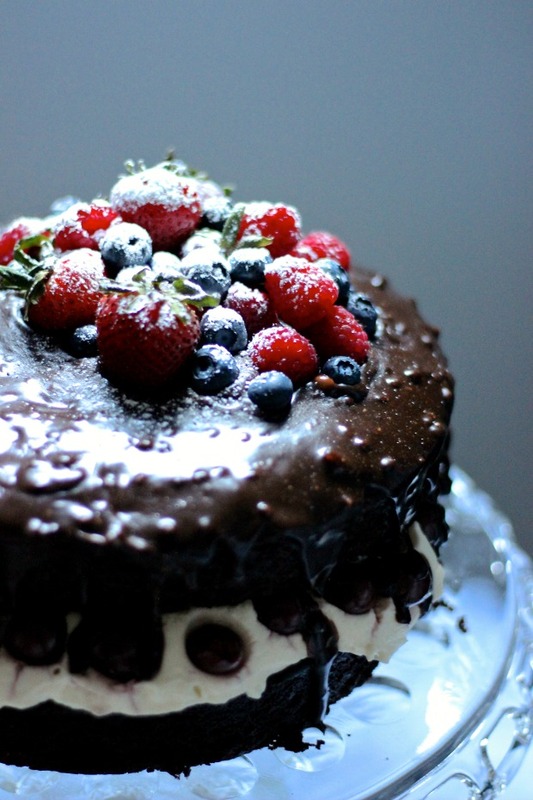 Do you like black forest cake? Or am I just being crazy? So decadent! It looks like it was worth the effort! !